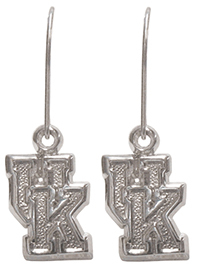 Item #QG-XG311SS: Sterling Silver Licensed "UK" University of Kentucky earrings with kidney wires. Item FTJ-259: 15x23mm 14Kt. Yellow Gold licensed "U of L" (University of Louisville) Cardinal charm of 2.39 grams. Item #QG-XC82: 10x12mm 14Kt. Yellow Gold licensed "UK" (University of Kentucky) charm. Item #QG-XC311: 3/8" long 14Kt. Yellow Gold Licensed "UK" (University of Kentucky) earrings with kidney wires for pierced ears. Item #QG-XC308: 10x10mm 14Kt. Yellow Gold licensed "UK" (University of Kentucky) paw print charm. Item #QG-XC81: 5/8"x3/4" 14Kt. Yellow Gold licensed "UK" (University of Kentucky) pendant. Item #QG-XC305: 5/8"x5/8" 14Kt. Yellow Gold licensed "UK" (University of Kentucky) Wildcat pendant. Item #QG-XC84: 7/8"x7/8" 14Kt. Yellow Gold licensed "UK" (University of Kentucky) Wildcat pendant. Item #QG-XC84SS: 19.5x22mm Sterling Silver Licensed "UK" (University of Kentucky) Wildcat Pendant. Item #QG-XC305SS: 15.5x16mm Sterling Silver Licensed "UK" (University of Kentucky) Wildcat Pendant. Item #QG-XC205SS: 15.5x16mm Sterling Silver Licensed "UK" (University of Kentucky) Wildcat Pendant. Item #SS-1444: Nickle-plaated key chain with 2001 Kentucky State quarter. Item #QG-QE4386-UK: Sterling Silver Licensed "UK" University of Kentucky 30mm hoop earrings with enameled Sterling Silver "UK" charms and top wires. Item #QG-SS002UK: 12.5x15mm Sterling Silver Licensed "UK" University of Kentucky pendant. 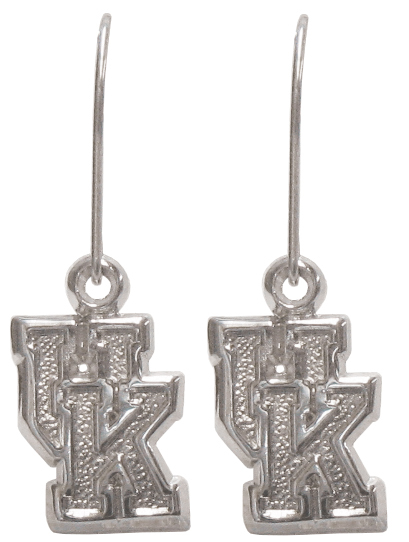 Item #QG-SS049UK: Sterling Silver Licensed "UK" University of Kentucky Wildcat earrings with shepherd's hooks.